Finally, a coffee mug that not only won’t spill, it won’t scald either — no matter how hot the brew! Tip and Sip was recently named one of the top 10 gifts for the gadget crazed, and among the top 100 hot new products. Coffee is brewed at 205ºF — too hot to simply swallow. 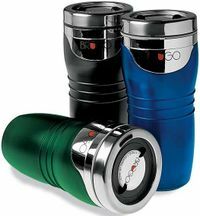 But Tip and Sip’s patented Temperature Control Chamber quickly adjusts your next sip to the "Perfect Zone" of 150-170º. Just tip away and swish gently to fill the chamber, then take a sip. No matter how hot the rest of your coffee, the sips you take from the Control Chamber are the right temperature — thanks to thermodynamic transfer technology! Double-walled insulation keeps the rest of your coffee piping hot — Tip and Sip regulates just the next swallow. 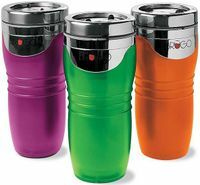 Triple-function lid lets you select “Lock” (sealed and spill proof); “Tip & Cool” (Temperature Control Chamber activated); or “Sip”, which bypasses the chamber. Mos def not TechnoDolt™-approved — I mean, I almost got burned just reading the description. Everyone else, go right ahead. Raspberry, Lime, Orange, Forest Green, Black or Blue. Nothing worse than a scalded tongue. It can ruin your whole day. So, now you tell me there is a cup for ultrageeks like me. I want mine in black. The idea of a safe sip of coffee is an instant imperative. If this works, and without spilling coffee down my work blouse while not scalding my mouth, it's ABOUT TIME! Lovely. Can they make a technically advanced coffee cup that makes you feel you're not sipping out of a can of motor oil? Oh, wait. Ceramic. And the coffee is even more enjoyable when you're not drinking it like a marathon runner with paper water cups. Genius!